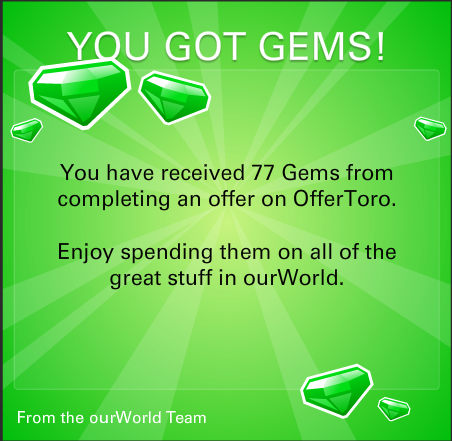 Post the offer that you've completed, along with the provider, and how much the gem payout was. Make sure before doing offers that you're not giving fake information guys, because you can get yourself banned from that sponsor doing so. I advise using your correct info while doing offers to avoid this situation. Just a note about lying and how you can get banned. What happens is that the agency paying out the gems tries to use your info and it fails or it's someone else's info who wasn't even interested. So for example, you sign up for a car insurance quote. You put in a fake name, a fake number, a fake address, you get the gems. Then insurance company wants to contact you because you said that you wanted car insurance to get the gems, right? So they call the number you gave. But there is no Bob Smith from 123 Main Street at that number. So now they know you've given fake information and wasted their time. So they complain to Sponsor Pay who has already paid you the gems, and that, my friends, is how you get banned. Players who watch videos and never (or seldom) receive Gems for them may have their browser Privacy settings set too high. Luckily, it's easy to change your settings so you can enjoy Gems from the ourWorld, downWorld, and Vegas World video offers. Set the Settings to Medium or "Accept All Cookies". At the bottom of the list, click "Show Advanced Settings"
Under the Privacy header, click "Content Settings"
Under the Cookies header, make sure the "Block Third Party Cookies and Site Data" box is UNCHECKED. If it is checked, videos will not award Gems. Click the Firefox tap in the upper-right of the screen. Select "Options" from the drop-down menu. Select "Options" (again) from the next menu. Under the "History: Firefox will:" dropdown menu, select "Use Custom Settings for History"
Make sure "Accept Third Party Cookies" is checked. If it is unchecked, you will not be able to earn Gems from videos. Originally created by Provoke on the official OW Forums. Found this on OfferToro while searching, paid within 5 minutes of completion.